Customers are increasingly looking for customized logistics services and a2b Fulfillment is an ideal position to meet those needs, President Ayal Latz says. “We’ve become very successful due to our ability to offer customizable solutions (for) a growing and diverse client base,” he says. Based in Greensboro, Ga., a2b offers order-fulfillment, contact center solutions and distribution support services, including kitting and assembly, order-management, returns and refurbishment, and ambient and climate-controlled warehousing. It began as a small toy firm that the Latz family founded in 1994. Latz’s father, Gary Latz, vice president of marketing, adds that this work also gave a2b experience that would pay off in the future. Because the toy industry was highly seasonal, “We learned how to ramp up and ramp down operationally, and became very efficient,” he says. 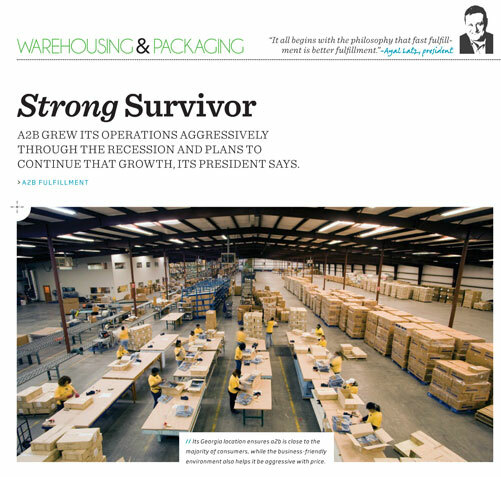 Eventually, a2b saw more potential in warehousing and it moved out of toy manufacturing. Today, it also serves clients in the personal care, book, electronics and DVD markets. And yes, there are still some toys to be found in the a2b Fulfillment warehouse.